In Feng Shui, horses represent YANG Energy, Tolerance, Fame and Success. Chinese horses are always shown as charging forward or moving forward. If you are facing is a very tight competitive situation, placing a Feng Shui Horses figurine is the best w.. In Feng Shui, horses represent YANG Energy, Tolerance, Fame and Success. Chinese horses are always shown as charging forward or moving forward. 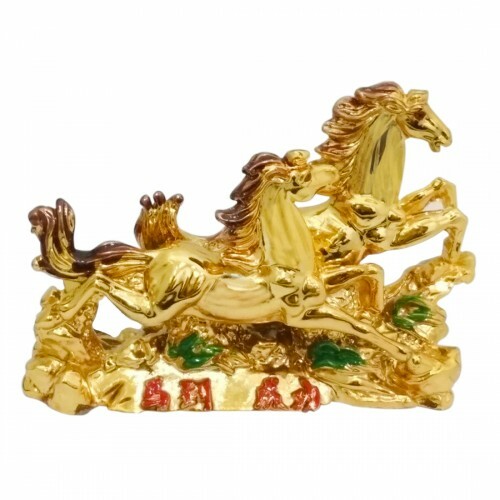 If you are facing is a very tight competitive situation, placing a Feng Shui Horses figurine is the best way to bring you victory luck as horse symbolize Victory, Strength and perseverance. It also symbolized a sign of respect, endurance and peace. It should be placed on table or office desk for new opportunities.